The NHL is considered the premier professional ice hockey league in the world. The sport at its finest. As a die-hard fan, you know that the best athletes, the most exciting plays and the biggest moments are all there. You study the schedule, research every opponent and when the puck drops, you’re on your feet cheering until the final buzzer. 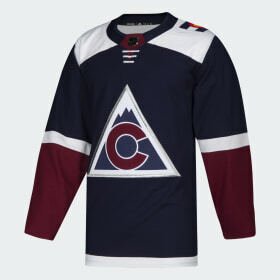 Whether expressing team pride or everyday style, gear up in NHL clothing from adidas. Shop Adizero authentic jerseys featuring team crests and the official NHL logo shield. Get apparel like tees, hoodies and jackets to rep your team from off-season to post-season. 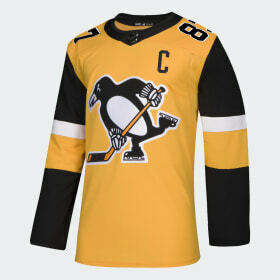 For every fan of every team, NHL apparel by adidas has you covered. In 2017, adidas became the official outfitter of the NHL for on-ice uniforms and licensed apparel. For the 2017-18 season, we unveiled the new adidas Adizero Authentic NHL jersey for all 31 teams, including the first-ever jersey for the Vegas Golden Knights. Drawing on deep-rooted sports heritage, we combine innovative methods and premium materials to engineer performance-driven hockey gear and clothing. Adizero technology makes jerseys lighter, cooler and stronger than ever, helping creators perform at the top of their game. In 2019 we released a game-changing Adizero Authentic jersey in collaboration with Parley for the Oceans. It was the first-ever NHL jersey to feature repurposed and upcycled marine plastic debris, created out of commitment to the athlete, the sport and the world.